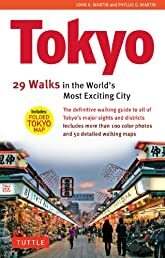 Tokyo: 29 Walks in the World's Most Exciting City is the only guide to the city that is exclusively a walking guide, with lively text full of facts and stories that emphasize the history, culture, architecture and spirit of the city and its neighborhoods. On foot and by train or subway, it takes you through the most fascinating parts of the modern megalopolis, while making the shogun's city—the Edo of samurai and geishas, merchants and artisans—and the outlines of old Tokyo come alive. From famous historical sites like the Imperial Palace to unique attractions like the Tsukiji Fish Market, this book offers something for every visitor. Getting Around Tokyo Pocket Atlas and Transportation Guide: Includes Yokohama, Kamakura, Yokota, Yokos..